Girls might want to have fun but it’s pretty darn hard when you’re handed a screenplay as lame as the one for OCEAN’S 8. This all-girl sequel of the popular OCEAN’S trilogy is as dull as a piece of cheap Lucite. As the film opens, master grifter Danny Ocean’s (George Clooney) kid sister, Debbie (Sandra Bullock, GRAVITY), is up for parole, having served five years in jail for art fraud. No sooner does she get out than she commits a series of petty crimes (theft, identity fraud, more theft,…) on her way to hooking up with her old partner-in-crime, Lou (Cate Blanchett, CAROL), who makes a good living doing her own bit of grifting. Debbie, we learn, has come up with an elaborate plan to steal a 6-pound, $150 million Cartier necklace at the upcoming Met Gala in New York and pin the theft on shady art dealer Claude Becker (Richard Armitage, THE HOBBIT trilogy), the man who double crossed her five years earlier. As the gala is only a few weeks away, the two women get to work assembling their all-female crew that includes diamond expert Amita (Mindy Kaling, TV’s THE MINDY PROJECT), fence Tammy (Sarah Paulson, CAROL; THE PEOPLE V. O.J. SIMPSON), pickpocket Constance (Awkwafina), computer hacker “Nine Ball” (singer Rihanna) and Irish clothing designer Rose Weil (Helena Bonham Carter, THE YOUNG AND PRODIGIOUS T.S. SPIVET). Their mark is petulant actress Daphne Kluger (Anne Hathaway, (COLOSSAL), who is invited to the star-studded event. Debbie’s plan is to convince Kluger to wear the necklace, convince Cartier to lend it out for the event, somehow get it off her without her or anyone else noticing, split it up, get it out of the building, fence it and ultimately shine the spotlight for the heist on Becker. I wanted to like this film, I really did, but it’s completely underwhelming. Although the ensemble cast is great and there are some wonderful scenes with Bullock and Blanchett (would be expect anything less from such accomplished actresses?) that are reminiscent of the bantering between Clooney and Brad Pitt in the first three OCEAN’S films, the script lacks any spark. Dodgy contrivances aside, the planning of the heist is more interesting than the heist itself. Part of the fun of a heist film is the heist that you don’t see. 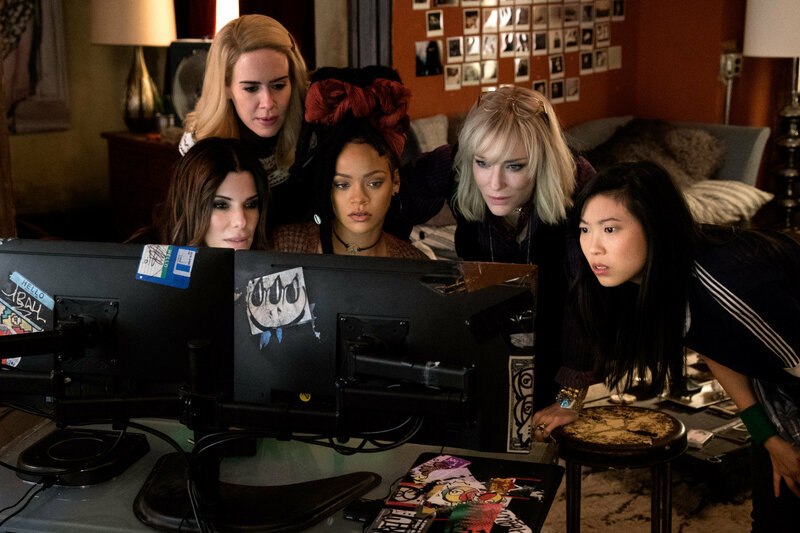 In OCEAN’S 8, when the reveal comes, it seems like it’s part of another movie. There are no clues meted out where audiences can look back at the film and say “Ah! Now I see it!” To add to the disappointment is the big set piece – the Met Gala. Fashion icon Anna Wintour must be less than pleased at how her event is portrayed. The Gala is widely regarded as one of the most exclusive social events in New York. At this year’s event, the red carpet fashions made the front pages of newspaper Arts sections around the world. Here, the gala looks like an expensive wedding where no one expects the bride and groom to make it past their honeymoon. The fault for this misfire lies squarely with co-writer and director Gary Ross (THE HUNGER GAMES; SEABISCUIT). He is no Steven Soderbergh (LOGAN LUCKY) and this film really needed Soderbergh’s touch and eyes. If there is going to an OCEAN’S 9, Warner Bros. would be well advised to get him back in the director’s chair.